Its becoming more and more apparent that how the China market goes so goes the rest of the world. 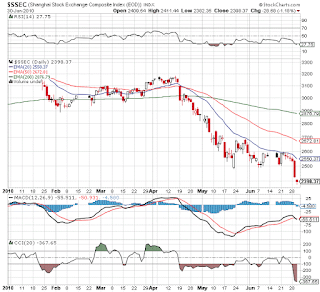 The Shanghai composite has been in a funk since July 2009 and recently fell off a cliff because of an obscure new Leading Economic Indicator report that was corrected to show a weak April number. That news alone sent shock waves around the world. The fear that China is about to collapse has caused panic in an already jittery market. Notice in the below chart how the China market led the US downturn by just over a week (SP500 peaked on April 26). The China selloff on Tuesday signaled the weakness around the world. Notice below that the CCI is a whopping -367. That shows extreme negativity in the market. The market sure ignores positive news these days. Chicago PMI came in at a very healthy 59.1 which should signal very strong ISM reports this week. The estimate for the ISM Index tomorrow is 59. Signs of very healthy growth in the Manufacturing sector. This may come to an abrupt end with the stock market doesn't turn around soon. Very interesting to see that employment jumped 5 points to 54. It appears that manufacturing is starting to ramp up hiring even if the rest of the economy is not. Orders are moving into production in what is another very strong Chicago purchasers report. The headline composite edged back six tenths in June to 59.1, well over 50 to indicate significant month-to-month growth for the area's business activity. Production rose more than three points to a very strong 64.2 with employment up five points to a 54.2 reading that indicates month-to-month hiring. Though the major indices floundered today with the Dow even closing down, the better diversified and reflective indexes were up very strong. The Russell 2000 was up 1.8% while the SP400 Midcap was up over 1%. Also, both the Nasdaq and NYSE had solid internals with roughly 70% of stocks up today. Honestly not sure what to make of a market where the average stock soared while the huge mega caps were basically flat to down. 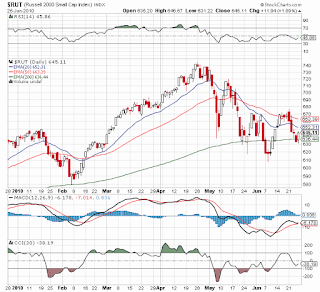 The Russell 2000 had a solid bounce off the 200EMA which would normally be very bullish. The SP500 closed another poor week closing below the 200EMA. 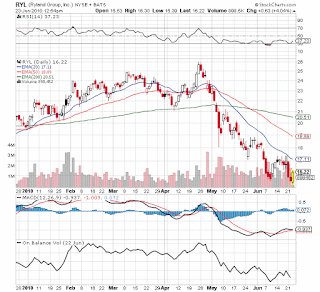 Most of the smaller caps appear to have broken the downtrend with former leaders like Goldman Sachs (GS) and Freeport McMoRan (FCX) breaking above the 20EMA while recent leader Apple (AAPL) struggled. Interesting change in direction for the homebuilder stocks. This morning we got news that New Home Sales were at an all time low or at least recorded low. Wouldn't you expect a huge selloff in homebuilding stocks? Having a few portfolios geared towards risk, I don't have any interest in buying a homebuilder yet evidently some investors are trying to catch the bottom. While todays numbers do suggest a potential bottom with nowhere to go but up, the sector could bleed for years at these low levels as Existing Homes and especially foreclosures are burned off. Why buy a new home with cheap existing homes all around? 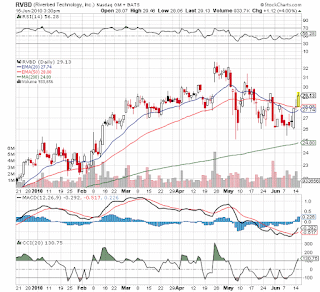 Ryland (RYL) is up 4% while Toll Brothers (TOL) and DR Horton (DHI) are both up 2%. Interesting trading indeed. As everybody fears the world falling into a double dip recession, the Richmond Fed Manufacturing Index reported a strong 23 today. The number dipped slightly from the 26 in May, but it still remained solidly above 0 signaling strong growth ahead. New orders remained strong at 25 even though Backlog fell to only. Employment data was more encouraging with Employees growth from 4 to 9 and the Average Workweek expanding slightly. All in the all the report suggests strong and steady growth ahead at least for that region. Most people don't follow this region as closely but it does give an earlier glimpse into the June economy. Posts fuzzy but if you click on the graph its easy to read. Even in the face of a 40% mining tax, China is still busy investing in Australia. That seems rather remarkable as any company or country with time on its hand would rather skip or defer any investments in Australia at this point. Maybe they have some inside knowledge that the proposed 40% tax will be greatly reduced, but this type of move only gives the government of Australia more ammunition to implement the tax. To us this signals how ferocious the demand for mineral assets is in China. How its not about to end any time soon. And how any assets outside of Australia at the moment are very attractive because of the tax issue. Notice how they seem desperate for iron ore mines that will supply the steel industry. This leads us back to investments in scrap steel recycler China Armco (CNAM) and met coal producer Puda Coal (PUDA). Both are Chinese companies recently up listed in the US that will benefit significantly from continuing strong steel demand in China. The hits just keep coming on Apple (AAPL). The stock just hit a new 52 week high and I even believe an all time high of $275. The new Iphone 4 as been a huge hit on pre orders and Wall St. can't seem to upgrade the stock fast enough. 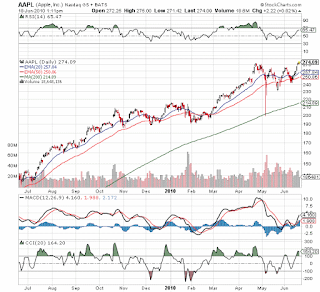 AAPL is a large position in our Growth and Opportunistic portfolios. Though the stock hitting new highs is exciting especially with the SP500 still 100 points below its April high and some 400 below its all time high, it does make us pause to ponder whether AAPL is getting too big. Market cap is now $250B with MSFT at $230B. For now, we'll let the stock run, but some time down the road maybe in the $300s AAPL will just run out of room for growth. This is just a beautiful chart. Anybody buying on the flash crash lows was a genius. Most stocks have retested those lows but AAPL never even approached them. After falling non-stop since the end of March, it finally appears that the downtrend has been broken in Cephalon (CEPH). 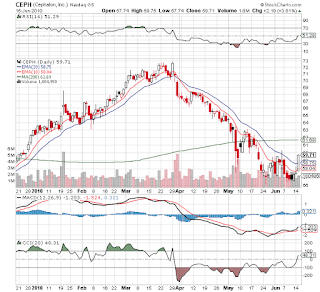 Since closing at a high of $72.10 on March 23rd, CEPH has continuously remained below the 10ema all the way to several days trading at $56. Today the stock not only handily zoomed above the 10ema but also the 20ema signalling a clear change of direction. Stone Fox Capital added to the Opportunistic and Growth Portfolios a few weeks back around the closing range of $59. Clearly we got on board a few weeks too early, but the price was too compelling at now just 8x next year. Also, it was an opportunity to build up some biotech exposure after the healthcare reform was finalized. The best part of adding this position now is that the risks are well defined. Healthcare reform is now known and the 20ema provides a downside limit. In the middle of last week, technology stocks seemed about to become technically broken. A lot of the stocks we follow had broken major technical support and were in danger of serious damage. As of this afternoon, the following stocks we own in the Opportunistic and Growth Portfolios turned very bullish. Each one has now cleared the 20/50/200EMAs. Of course, it helps that the SP500 cleared the 200MA which is very bullish, but the tech sector seems ready to lead the market highers. These stocks have strong balance sheets and hence avoid any of the issues regarding debt concerns and funding. Instead they can focus on the strong growth in the developing economics and a rebound in the US. They all have some overhead resistance and still need to prove they can clear recent tops before the all clear is sounded. After the close, Terremark (TMRK) announces a dela with Verizon Business, unit of Verizon (VZ) to utlize 25,000 sq/ft in the Miami and Virgina data centers. At first glance this seems like a significant deal for TMRK, but no financial terms were released. The main reason given for the win is that TMRK has data centers that meet or exceed federal standards and Verizon Business has a thriving business with the governemnet. Anybody following us knows that our big reason for buying TMRK originally was its connection to the governements movement on the internet. Our Net Payout Yield Portfolio has always maintained that stock buybacks play a bullish story and lead to outsized returns. That portfolio has beaten the SP500 by nearly 5% per year since starting in 2007. Too many investors focus squarely on dividends which are double taxed and provide very little flexibility for the corporation. Its increasingly common for a company to pay a 4% dividend and buyback 2% of stock. The combined yield would be 6%. Isn't that better then just a 4% dividend alone or even a 5% dividend? If you need the cash, why pay take some profits on the larger gains. Mark Hulbert reported that buybacks are starting to tell a bullish story for the market. Unlike in 2008 when corporations dramatically reigned in buybacks in order to conserve cash, this time they are starting to announce some serious increases over last year. Some interesting facts from Sam Stovall of S & P. Basically the market tends to rally prior to a 15% correction. If not, it almost always leads to a new bear market that is defined as 20% down. When hitting a bear market, the average drop is usually 30%. So we either bounce off 1,040 or it really is likely that we hit the 20 or 30% declines. Find it interesting that at times of such well defined trading levels that so many experts like Sam want to 'wait and see'. With commissions so low, it seems better to have bought the lows today with tight stops if the market shows any further weakness leading to the 15% correction and hence likely following panic repeat of 2008. Otherwise, an investor ends up buying at much higher prices in the 1,100 level when it supposedly is safer, but you then risk a drop back to 1,040. Finally the number that matters the most in the jobs report. The total hours worked is what should indicate the amount of labor demand in the economy. The focus on just new hires seems absurd. Now the demand might be for temp help, or overtime hours, or actually new hires, but the demand is picking up regardless of what the market thought of the jobs report on Friday. Anybody studying the jobs report should already know that the hours worked jumped from 34.1 to 34.2. The economists expected a flat reading with the creation of 150K or so public jobs. Well, we didn't get the jobs, but we did get more hours equivalent to 315K new jobs. Which one is more important? For the economy it doesn't really matter. More hours worked equals more money to spend. For the person looking for a job it matters big time. On the flip side though, the workers getting that extra work are likely very happy to see a much fatter paycheck at this time. 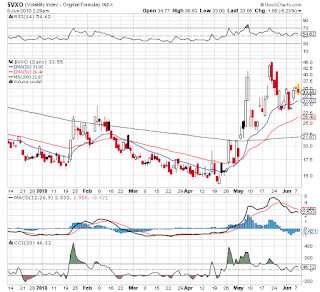 Some interesting action in the VIX and VXO this week and especially today. Even though the market turned down today and yesterday, the VXO especially hasn't confirmed further moves down. With the markets mixed at the moment, the VXO is trading with a 5% loss. For now at least, the end of May marked the peak in fear. Could be very constructive for a move higher. With all the supposedly disappointing news (hours worked and wages were up but thats a different story for later) about the Government's Non-Farm Payrolls report on Friday, it's worthwhile to take a look back at the Monster Employment Index released the day prior. This report showed conflicting data to the NFP report. Monster's Index showed a stronger job market in May and no signs of declines. These numbers aren't manipulated like that of the government's data so they should present a much more reliable source as well. After all, the government number could be raised or lowered by 50K easily when its revised next month. Below is just the highlights that they summed up nicely for us. Read the whole report and you come out with a very positive view of the jobs market. Contrary to the headlines the US economy continues to grow at a rapid clip. Without changes to interest rates and corporate balance sheets, it seems difficult to understand how this growth will unwind. Surely it might slow due to concerns in Europe, but it seems unlikely that the economy will be derailed. Nice summary of the ISM Services Index from First Trust. The index remained at 55.4 for the 3rd consecutive month in May. Any number is the mid 50s is very bullish. The important note is that the Business Activity index hit 61.1 and is a more natural signs of the activity in the economy then the overall sentiment number. Employment finally hit above 50 for the first time since the recession began. When business activity is at 61 and employment can only barely creep above 50, corporate profits should be soaring. So should the stock market but thats a different story right now. Earnings will eventually lead the market higher. The CEO of the world's 2nd largest chemical maker says the market should stop panicking over the debt crisis in Europe and China growth. According to him, company sales indicate consumer demand is improving in both regions. Interesting comments from a very outspoken CEO in the past. If he isn't seeing a slowdown, then it likely isn't happening. The US ISM Manufactoring Index just posted a 59.7 number for May so the data backs up his claims as well. The real question the markets are dealing with is whether the crisis in Europe eventually pushes the world economy over the edge. The markets recent plunge suggests that to be the case, but the data up to this point argues a different result.